These Uniquely Designed Candlesticks Are Specially Made For The Broken Glass From A Wedding. 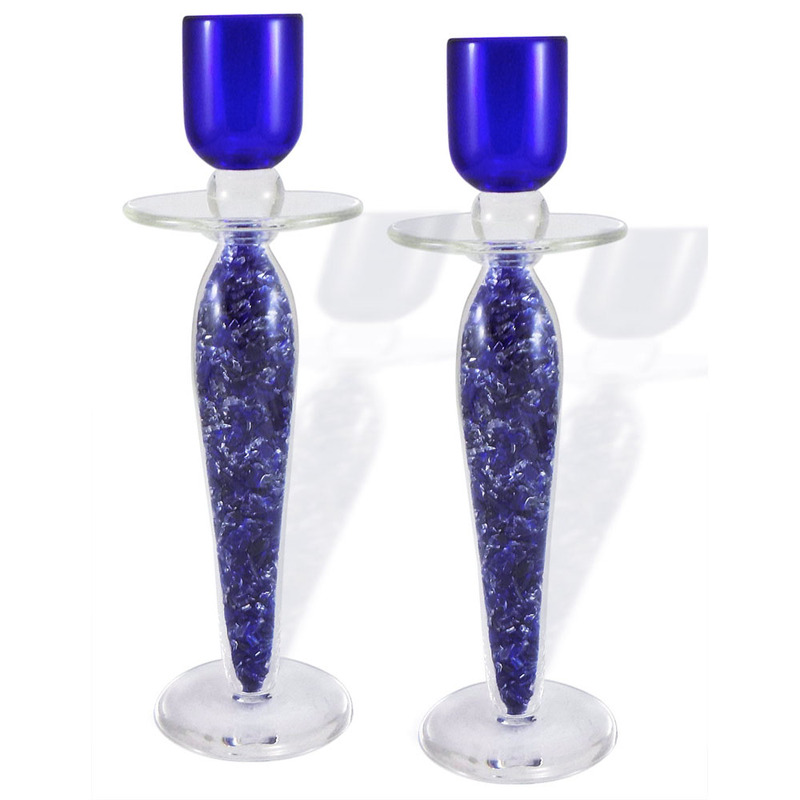 The Glass Is Inserted Into The Stems Of The Candlesticks Creating A Beautiful One Of A Kind Keepsake Item. With Just A Few Easy Steps These Candlesticks Can Be Personalized With The Wedding Couple's Glass. 1. We Can Send You A Gift Card With A Picture Of These Beautiful Candlesticks For You To Present To The Wedding Couple. 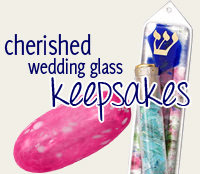 You May Also Purchase Separately A Glass Vessel In A Satin Pouch, To Be Crushed Under The Chupah. 2. Send Us The Broken Glass After The Wedding. 3. A One Of A Kind Pair Of Candlesticks Will Be Made For You, Encasing The Couple's Wedding Glass Inside Of The Glass Base. Extra Glass May Be Added To Fill Out The Stems. Your Unique Candlesticks And Any Extra Glass Will Be Returned To You Within 4-6 Months. Each Candlestick Measures A Different Height, Approximately 9" And 10" Tall. You May Select The Color Of Glass To Be Used On The Top Candle Holders Of The Candlesticks. 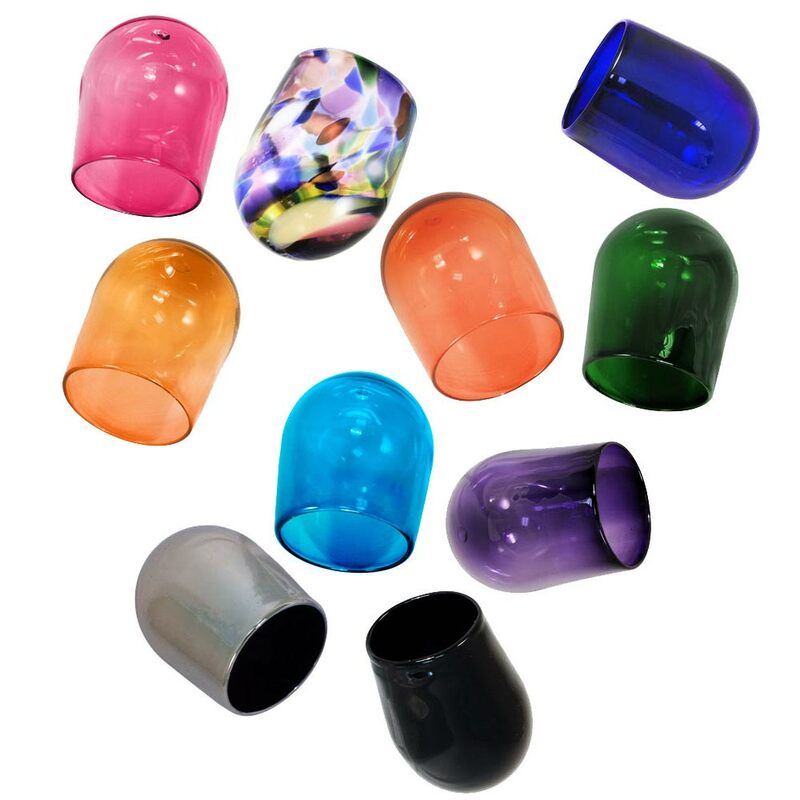 *Please Note: An Additional $15.00 Will Be Added To Your Regular Shipping Cost At Checkout To Cover The Additional Shipping Charges Of Sending Your Glass To And From The Artist's Studio. This Item Does Not Qualify For Any Free Shipping Promotion. Mail Us The Broken Glass So The Artist Can Create Your One Of A Kind Keepsake. We Recommend That You Put The Glass And Pouch Inside Of A Plastic Bag And Send It In A Box So The Glass Is Secure. We Suggest That You Send The Box With Some Type Of Tracking So You Are Assured That It Has Reached Us. It Is Important The You Enclose A Copy Of Either Your Original Order, Packing Slip Or Gift Card Along With Your Current Contact Information. When Will I Receive My Finished Keepsake? Once We Receive Your Glass You Can Expect It To Take The Artist Between 4-6 Months To Create Your Keepsake. The Keepsake Will Be Shipped To You Along With The Pouch That Your Glass Arrived In. If There Is Any Unused Glass It Will Also Be Returned. The Artist Is Creating This Wonderful Work Of Art By Hand. Each And Every Piece Is Personally Created For You With Your Own Wedding Glass. 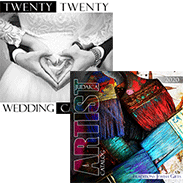 Wedding Glass Keepsakes Are Very Popular Wedding Gifts And The Artists Are Always Quite Busy With Orders.